This is a great day to take the leap and do something different. It might seem crazy and you have no idea how it’s going to turn out, or maybe even how you got on this path in the first place, but here you are. It’s time for you to make your move and do so without fear. The Fool card isn’t telling you to be an idiot, but rather to stop double thinking yourself all the time and worrying that every single thing is in order before you can make a move. Life isn’t really that logical. There is no way to prepare for all eventualities, no matter how smart you are. Do what you can and let the universe take care of the bigger story. 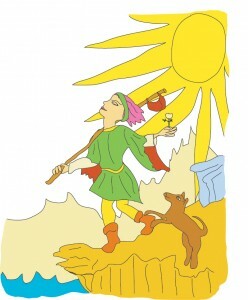 You are currently reading Tarot Card of the Day – 2/27/11 at The Tarot Room.